Curious as to how the current market is impacting real estate values in our neighborhood? Did your property taxes go up last year? Would you like to refinance to take advantage of still record low interest rates, and possibly get rid of your mortgage insurance payments? Or perhaps you wish to obtain a Home Equity Line-of-Credit to finance that remodeling project you’ve been putting off? Maybe you just want to see how much your property has appreciated. 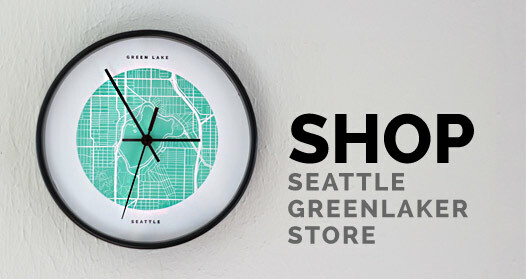 The statistics provided in this post are hyper-local, capturing only Green Lake and Tangletown as outlined in the map above. The numbers are split out into single family homes including townhomes, and due to popular demand we are also providing the condominium stats this time around. 46 fewer homes (or 16.6% less) were sold in 2014 because of a severe shortage in inventory leading to increased bidding wars and continued price appreciation. The median sales price rose 15% last year with the average sales price landing 4% over the list price (we have seen escalations as high as 20% over listing price for certain properties). Average-days-on-market were down slightly from 20 to 18 days, but only because listing agents almost always held the property on market for at least 1 week before looking at offers, giving the market a chance to discover the property and compete for it. Statistics in the tables below are based on home sales in the area outlined on the map above and are derived from the Northwest Multiple Listing Service data. In the condo market, the same number of units were sold in both 2013 and 2014, but it took an average of 3 weeks to sell a property, which is 12 days less (or 38% lower) than the year before. The price appreciation for condos was 9.2% and on average condos sold for 2% more than asking. The following charts capture Green Lake (area as defined by NWMLS data) real estate trends for 2013 and 2014. The bar graph tells us how many homes were available for sale (light green), how many went under contract (red line) and how many sales closed each month (dark green). We can see with the light green bars there were clearly less homes for sale this year, yet buying (red line) activity was strong throughout the year. And while there was a seasonal slowdown in November and December, more homes went under contract during that period compared to the year before. 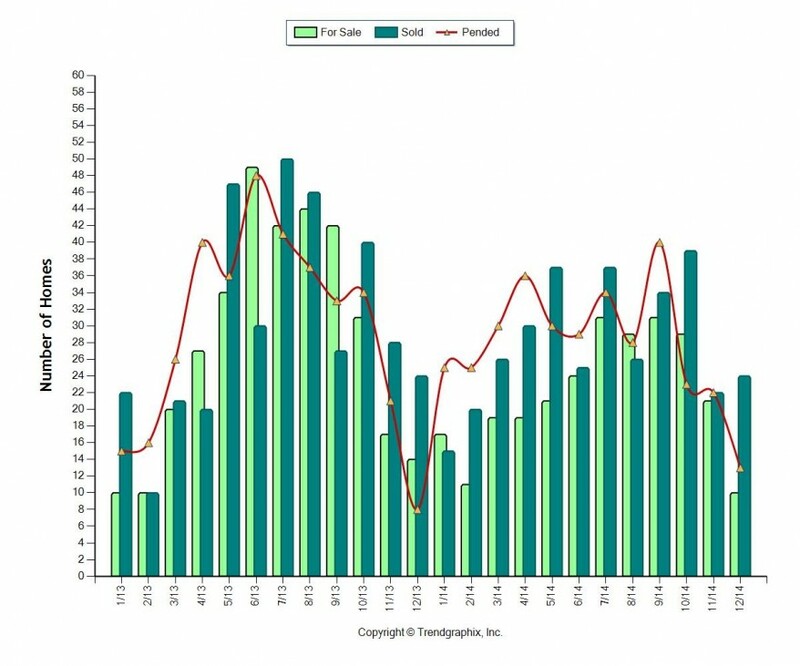 Actual closed sales (dark green) are lower than last year due to the lower supply in active listings. Intense bidding wars and price increases are how these statistics played out in the marketplace. 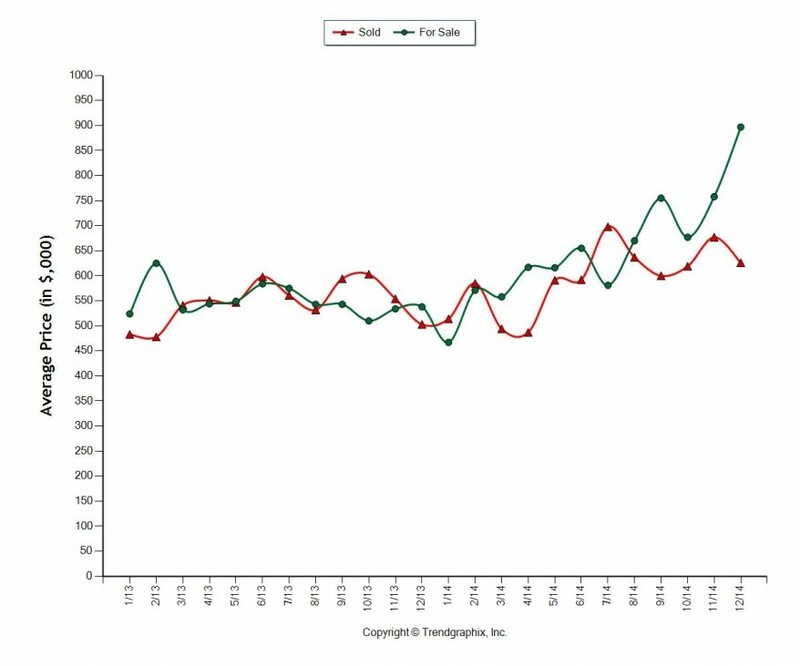 In this chart the green line represents the average list price of a home while the red line shows the final sales price. Looking at the last few months of 2014, it appears that listings may have been overpriced. Despite the hot “Sellers’ Market,” eventually buyers are likely to push back and prices escalate less rapidly, causing the market to become more balanced. And that would be our hope for 2015. The chart above illustrates months of inventory. 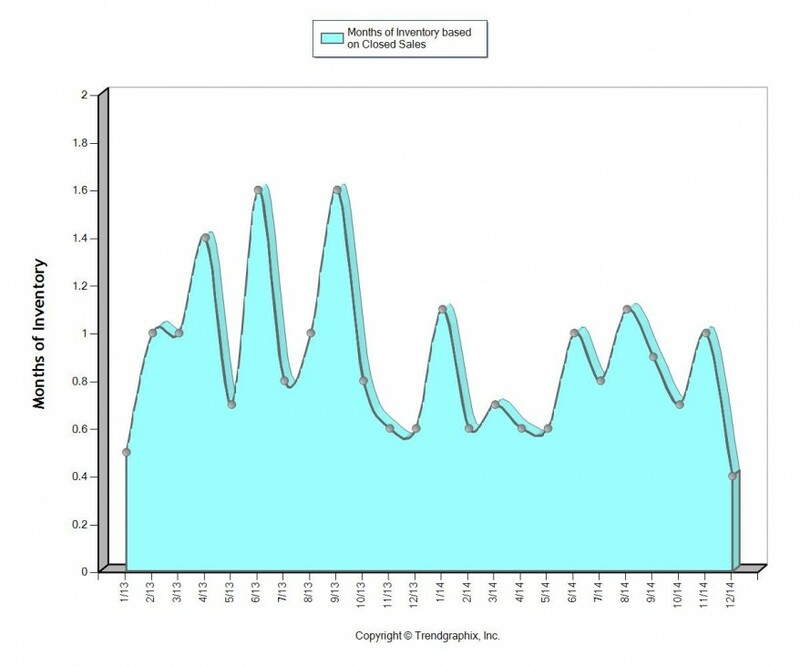 It is derived based on a calculation dividing the number of active homes for sale by the number of homes that went under contract in a given month. It attempts to project how many months it will take for the entire available inventory to sell. Anything under 2 months of inventory represents a Sellers’ market. For much of 2014 inventory was around 1 month and went as low as 0.4 in December, which translates into a “crazy” Sellers’ market. Overall, inventory was marginally higher in 2013 versus 2014. Bottom line: demand drastically outpaces the supply of homes; a trend that appears to be continuing this January with very few homes available for sale. Barring any unforeseen major changes, we expect the strong housing market to continue in the Green Lake area. 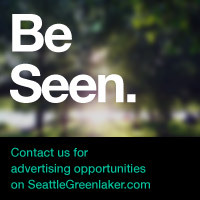 The strength of our local economy continues, Green Lake attracts exciting new businesses adding to our urban walkable offerings, our schools are quite desirable and commuting from Green Lake to almost anywhere is a breeze. All these factors contribute to making Green Lake real estate a desirable commodity, besides being the neighborhood we all love to live and thrive in. That said, buying activity may slow down if and when interest rates go up.